Start with easy steps such as clues of 1, or clues of N where N is the size of the grid. Make small pencilmarks noting which skyscrapers are allowed in the empty squares. This will help narrow down possibilities later on. Always double check before placing a skyscraper. For faster solving, skyscrapers can be placed by pointing mouse on the desired square and then typing with the keyboard. 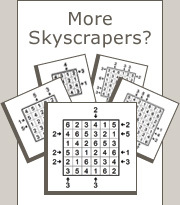 Use pencilmarks to note which skyscrapers are allowed in the empty squares. This will help narrow down possibilities later on. Use the Highlight Skyscrapers feature to see how many buildings are visible when viewed from the direction of a clue. To highlight skyscrapers in a row or a column, click mouse on the desired clue.